I have joined the Twitter millions in the last month. My goals were to check out the hype about social media, make it a medium for my start in blogging and also to see what I could learn from others. Having worked in healthcare for a long time and seen the various technological changes affecting it over the last 25 years or so, I thought the social media revolution was something healthcare organisations would have already embraced. However, I didn’t find many in healthcare have embraced it especially in the UK and it appears to be left to the younger consumer demographic or the big brand companies. Social media seems to have passed by UK healthcare, the way other consumer technological improvements have also passed by it for one reason or the other. The usual reason quoted for such lack of take up being lack of funds to invest into change. To be fair, I should define healthcare into hospitals and pharma and healthcare vendors. Pharma and healthcare vendors have adopted Twitter and put out their products and services to the Twitter community. What I found was that a few of the large, well known hospitals are on Twitter and Facebook and these are mainly based in the US while the UK NHS hospitals have tended to mainly put their charity arms on Twitter to publicise their fund raising efforts. I also found some useful information being put out by large medical research organisations. The Twitter sites with the largest number of followers I have found are @Webmd with @Mayoclinic running second. Having followed both those for a short while, I found the @Mayoclinic tweets more useful for my purposes, probably prejudiced by my having worked in hospitals for a long time! The story is a bit different with Facebook where some US hospitals appear to be using it well, probably because of an older demographic on Facebook. However, the use of social media overall seems patchy. So are healthcare providers missing a trick by not adopting social media more actively? I think so and so does a recent US survey of consumers carried out by PwC. It found that a third of users now use social media sites to seek medical information and track and share symptoms. 80% of the 18-24 age group would use social media to share health information whilst only 45% of the 45-64 age group would do so. More interestingly, 72% said they would use social media to schedule doctors’ appointments and 41% said information on social networks would influence their choice of doctor, hospital or medical facility. However, as I expected, PwC also reported that many healthcare organisations leave their social media efforts to be managed by marketing staff, with a few delegating it to the IT department! That has to be true in a few hospitals! Social media should be part of business strategy and taken up at the highest level in healthcare organisations, otherwise the early adopters will gain the advantage and leave the majority behind. 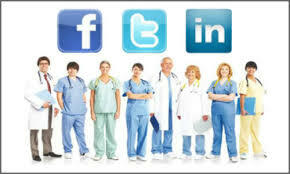 Social media connects with patients, doctors and also serves as a recruitment tool. As my experiment with social media progresses, I will update this blog in a few months’ and report on how healthcare organisations are progressing.